Charlene Randolph was born in the small upstate New York town of Corning. She grew up primarily in the Central New York area. Her major in high school and college was predictably, Studio Art. Her forte was in two dimensional work, using oils, oil pastels, colored pencil and pen & ink. That all changed when Charlene attended her first pottery class at the age of 35. It soon became apparent that a deep love and passion to use clay as a means of self expression was in her DNA. Starting out with all used equipment and a small corner of her basement, she began to chalk up the hours of practice that have brought her to where she is now. Twenty plus years and she is still creating fresh work. Charlene has experience in the retail and wholesale venues for selling hand crafted artwork. 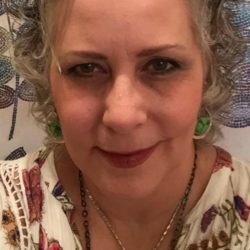 Over the past ten years she has sold at American Craft Council Show, Baltimore; the Buyer’s Market, Philadelphia; Wholesale Crafts.com ( online) and has recently been accepted to The SugarLoaf Craft Festival shows starting in the spring of 2017 @ Gaithersburg. Mrs. Randolph also promotes a high quality local craft show, ArtFully Wilde, in Columbia , the second weekend in November. Currently, Mrs. Randolph has a studio in her barn, outside of Baltimore, MD. She has recently shifted her focus from a brick and mortar gallery and studio located in Old Ellicott City, MD to being a full time artist.